When you walk into Harlem United’s offices at 306 Lenox Avenue, Gwen’s smiling face might be the first one you see. It’s been 17 years since Gwen joined the Harlem United family, and she has spent each and every one reaching out to her community to lend a hand. Gwen came to Harlem United when her doctor recommended she join the agency’s Adult Day Health Care program. After six months, she was able to transition into a stipend position with the agency. That turned into a full-time role as a medical clerk. At the time, Harlem United had only just started offering medical services, and the agency was focusing heavily on reaching new clients. Gwen’s role was stressful, sometimes keeping her at the office until late at night. She spent her days liaising between clients, doctors, and pharmacists, doing everything she could to help the fledgling program run smoothly. 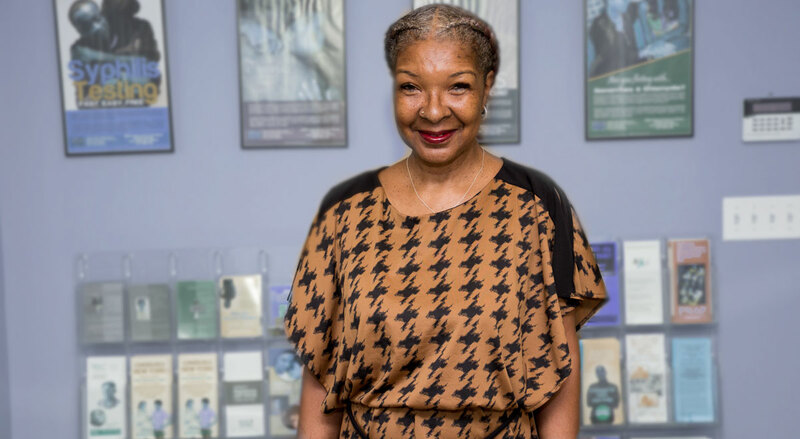 Three years ago, she changed roles and started working at the front desk at Harlem United’s 306 Lenox Ave. location, where she helps other Harlem United staffers with their projects. She says she loves to stay busy and reaches out to her coworkers to ask how she can help them. We regret to share the sad news that Gwen Palmer passed away on Friday, February 8, 2019. Gwen was a very special person, a long-time member of the Harlem United family, and she touched many lives. She will be missed by staff and clients alike. 2 Replies to "Staff Spotlight: Gwen is Here to Make a Difference"
Yeah, that’s our beloved Gwen!!! Hello Ms. Gwen, hope you remember me? Gladys Benitez. I was the RN there way back when & worked with Mr. Carlos. You look simply marvelous darling! I’m back in Texas. I’m revamping my resume and needed some info and what do you know….Up came this ‘Sparkle of a Sun Shine Face!” and wow how shocked I was when I saw that Don had passed. Please give my regards to any that may remember me…Ciao and hit me up some time!